While most national parks span hundreds of miles and feel far removed of cities and an industrial lifestyle, Hot Springs National Park challenges the status quo. The smallest of the national parks – at 5,550 acres – Hot Springs actually borders the city that has made a profit out of tapping and distributing the park’s main resource – mineral-rich waters. Many Native Americans tribes had been settling in the lands for untold numbers of years before any European establishment. The natural healing power of the water attracted them to the area. They named the land “place of the hot waters,” a name that has stuck over time. 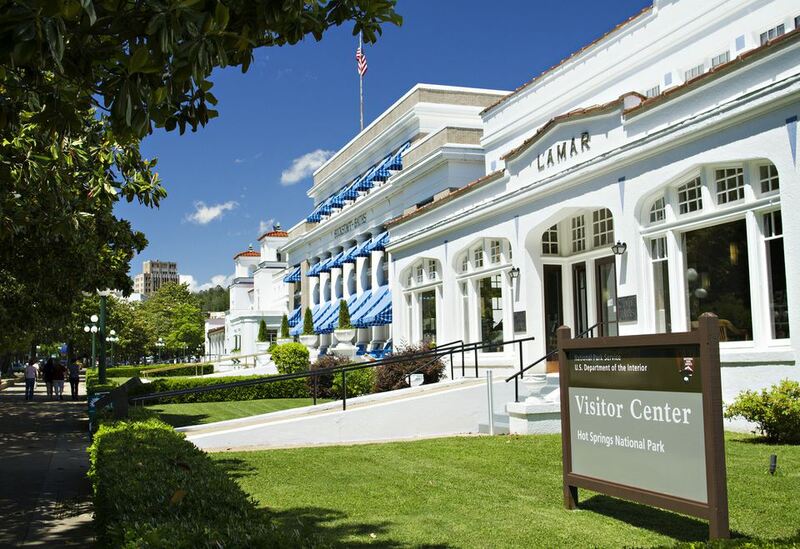 Hot Springs National Park actually refers to itself as “the oldest park in the national park system” because 40 years before Yellowstone became the first national park, President Andrew Jackson dubbed the hot springs a special reservation. The lands were settled into by many Native American tribes who believed in the waters natural healing powers. The federal land was eventually designated a national park in 1921. By that time, Hot Springs was well-known in the area as being a spa where people sought relief for their aches in pains in the mineral-rich waters. Promoters covered, piped, and diverted the springs into bathhouses along Central Avenue – the main street of Hot Springs. Bathhouse Row, as it is known, was placed on the National Register of Historic Places on November 13, 1974. Today the park protects eight historic bathhouses with the former luxurious Fordyce Bathhouse which houses the park visitor center. The park is open year-round but the fall could be the most spectacular time to visit. That is when the surrounding mountains reveal stunning fall foliage. Summer months can be a good time for vacation but keep in mind that July is particularly hot and crowded. The winter may be another option – it is usually short and mild. And if you are looking for wildflowers, plan your visit for the month of February. The closest airport is located in Little Rock. (Find Flights) From there, head west on I-30. If you are driving from the south, take Ark. 7. If you come from the west, you can take US 70 or US 270. There are no entrance fees for Hot Springs. Camping fees will be charged at $10 per night. If you have a Golden Age/Interagency Senior Pass or Golden Access/Interagency Access Pass card, you will be charged $5 per night. Utility hookups are available at specific sites. The fee for these sites is $24 per night or $12 per night with a Golden Age/Interagency Senior Pass or Golden Access/Interagency Access Pass card. Bathhouse Row: Be sure to tour the elegant buildings lining Central Avenue. It is the equivalent of four city blocks and takes around two hours to tour. DeSoto Rock: This giant boulder commemorates the Native Americans that named the land as well as explorer Hernando de Soto – the first European to see the lands. You can see and touch the hot water here as well. Hot Water Cascade: Created in 1982, the water flowing here is around 4,000 years old. Heated deep in the Earth, the water returns through faults in the rocks. Check out rare blue-green algae that thrive in the hot waters. Tufa Terrace Trail: This trail is recommended if you want to visit springs that aren’t well publicized. Gulpha Gorge: At 1.6 miles round-trip, this area has more of the traditional terrain of a national park. Woodlands rich in dogwood and redbud trees, wildflowers, and hiking trails are a hit for visitors. There is one campground – Gulpha Gorge – which has a 14-day limit. It remains open year-round and is filled on a first come, first served basis. Tent and RV sites are available. See Fees/Permits above for prices. Many hotels, motels, and inns are located in the Hot Springs area. (Get Rates) The 1890 Williams House Bed & Breakfast is a unique place to stay with seven units available. The Austin Hotel has a lot of rooms — 200 to be exact. Another affordable option is the Buena Vista Resort where units feature convenient kitchenettes. Ouachita National Forest: If you don’t have much time, head 10 miles out of Hot Springs and check out this pine-hardwood forest full of lakes, springs, and waterfalls. Activities include hiking, boating, fishing, horseback riding, and hunting. Visitors may camp at one of 24 campgrounds which are open year-round. Ozark National Forest: Located just 80 miles north of Hot Springs, this national forest if full of oak, hickory, and pine – all boldly displayed across the Ozark mountain bluffs. The Blanchard Springs Caverns are popular to tourists as are five wilderness areas spread out over 1.2 million acres. Visitors can hike, fish, camp, participate in water sports, and even go horseback riding at this destination. Holla Bend National Wildlife Refuge: Even close to Hot Springs, only 60 miles away, is this safe haven for wintering bald eagles and migratory waterfowl. Stretching across the Arkansas River, this refuge offer boating, fishing, hiking, hunting, and scenic drives to visitors. It is open year-round from dusk to dawn. Buffalo National River: This park preserves 135 miles of the Buffalo River and surrounding lands. If you are looking to white water raft, this is your spot. Other activities available include boating, fishing, swimming, hunting, and camping. It remains open year-round and is located about 170 miles from Hot Springs.